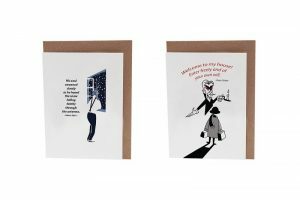 After being awarded a Highly Commended in the Best Gift category for graphic book last year, we are back for our third consecutive year at Showcase Ireland 2017 at the RDS in Dublin from 22-25 January. Come by our stand C16 in Design Ireland to see our new collections. Have a first look at our new Gulliver’s Travels range celebrating Jonathan Swift’s 350th anniversary this year. 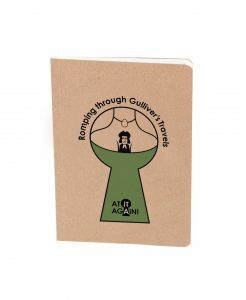 Our new pocket guide follows Gulliver’s journey and explores the places that inspired Ireland’s most famous satirical writer. The book is accompanied by a colour print and greeting card. 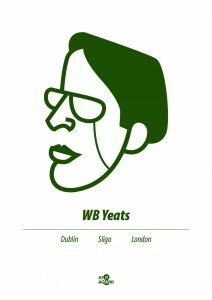 At Showcase we will also be launching the first products in our new Irish Writers Collection, with six of Ireland’s most famous authors gracing A3 prints and a set of greeting cards. At it Again!’s wonderfully creative Romping through Irish Literature series of pocket guides, prints and greeting cards explore famous writers, their works and the places that inspired them. Dubliners Snow & Dracula Castle Card by At it Again! Why not learn to love James Joyce’s Ulysses, unearth Bram Stoker’s Dracula or go on a fantastic trip with Gulliver’s Travels? At it Again! are stocked in museums, gift, book and design shops across Ireland and beyond. The product range is created and printed in Dublin using sustainable materials and packaging. We look forward to seeing you at stand C16! Events 2017, Design Ireland, Irish Design, RDS, Showcase Ireland. permalink.